What is “National Panic Day”? Officially, today is known as “National Awareness Day” not “National Panic Day.” For the reasons stated below, I am calling it “National Panic Day” which coincides with DHS reissuing their National Terrorism Bulletins this month. DHS and law enforcement have created a national day that glorifies spying on your family, neighbors, coworkers, classmates and much more. Because DHS and law enforcement don’t do enough spying, they have created a National Awareness Day that encourages domestic spying. 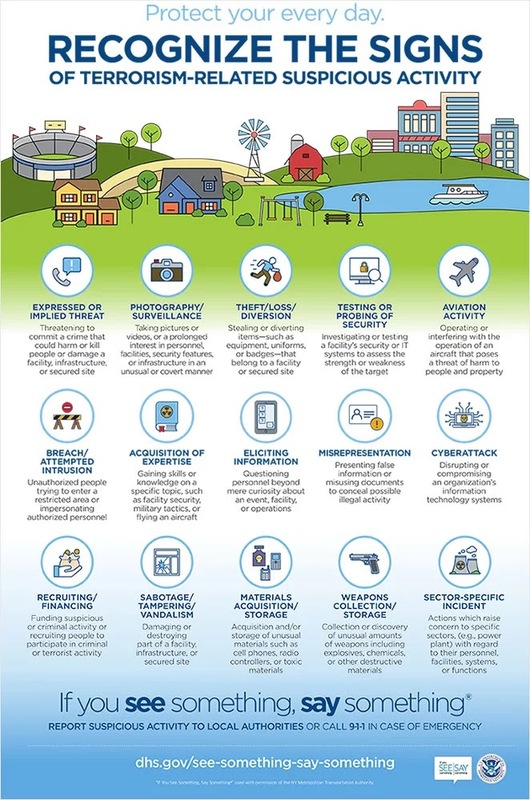 If you think “recognizing the signs of terrorism-related suspicious activity” ended with just an infographic you would be mistaken. DHS has also created an entire page of suspicious young Americans doing things like bicycle jumping, eating from food trucks and sitting in a school hallway. Besides trying to appeal to X Games fans, what purpose do these videos serve? I’ll give you a hint, DHS and law enforcement want young people to be afraid of everything. Besides being blatantly hyperbolic, these videos play on young people’s fear of terror and encourages them to report “harmless activities.” This is what happens when you indoctrinate an entire generation of millennial’s who have grown up living in fear. My god, what Senator Joseph McCarthy would have given to be alive today. What better way to justify their existence [DHS] than by appealing to the younger generation and encouraging them to report harmless activities, family, friends, neighbors etc.